Haha. I'm with you. I only use IE8 to update my XP. That said, MU found it quick and it installed without a hitch. It almost seems as if XP is becoming a reliable O/S. I guess I should be fair: the bug also affects IE 11 and Edge, which folks do use. Had to apply the same update to my Win 7 system. IE 8 just got the update as a side benefit. Not that I'm complaining! There are still a tiny number of Web sites that use ActiveX so they only render properly in some version of IE, and this makes those sites less likely to host a virus. Hi, is this update non-SSE2 compatible or not ? Hi Guys, I'm pre-patched for now. Woody reports out-of-band kb4483187 IE update causes crashes on Newer systems. Anyone have spotted any IE misbehaviour on XP after applying recent patches? The only anomaly I found with this IE update, off topic I know, is that Windows 8.1 did not have to be restarted after installing it, which is very unusual for an IE update! Both my Windows XP installations and my Windows 10 installation did have to be restarted, as I would expect. I've had no issues with either XP or Windows 7. But then, I rarely use IE. No problems here either on my WinXP machine. Woody reports out-of-band kb4483187 IE update causes crashes on Newer systems. i7 6700HQ 4c/8th 2.60GHz, 16GB (8x2) DDR4, 2TB HDD Sata III (1TB + 1TB), NVIDIA 950M GPU. No crashes and it's a fairly new system (January 2016). What is this update? it always fails even manually installing it. Download and manually install the version for Windows XP from the following link. 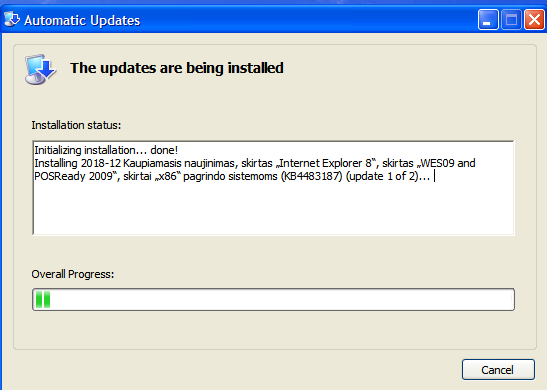 The update KB2686509 differs to the Windows Embedded version! When installing Windows XP first, the available and desired updates should be installed by WU / MU, only after that after several searches no more updates should be made to the POSReady key in the registry. Then the order and the correct update KB2686509 for Windows XP will be installed. My XP machine seems to disconnect from home network connection and then reconnect a few times a day (and night). I do not see this while I am using the machine, but I get messages in the tray that now I am connected to the internet. (I leave my machine on all the time and reboot maybe once every ten days.) I don't see the same issue on my Win 7 machine (same network). How can I trace the issue? Is there a small-footprint monitoring program that might help?